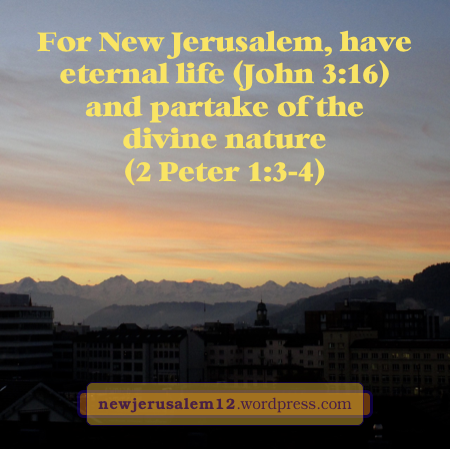 Praise the Lord we have the divine life, Christ, the life-giving Spirit in our spirit now (Col.3:4) and we are partakers of the divine nature now (2 Peter 1:3-4). Christ is the eternal life (John 3:36), the indestructible life (Heb. 7:16b) and the incorruptible life (2 Tim. 1:16b). Christ is the embodiment of the Triune God. He is God Himself. He must increase in our being while we decrease. As Brother Don says, “as this divine life and nature spreads in our being, God’s expression develops in our being.” As Christians our individual lives should express God by His divine attributes becoming our human virtues for a corporate expression of our God here on earth. In John 13:34-35 Jesus said, “A new commandment I give to you, that you love one another, even as I have loved you, that you also love one another. By this shall all men know that you are my disciples, if you have love for one another.” When God’s corporate expression is fulfilled, the one new man will be a reality culminating in New Jerusalem. Lord open our eyes to have a corporate view of Your divine economy! Elizabeth, thank you for your comment and the verse references. Lord, spread Your expression through us! No need of the sun, no need of the moon, no need of candles, no need of electric lights, because the glory of God illuminates New Jerusalem.